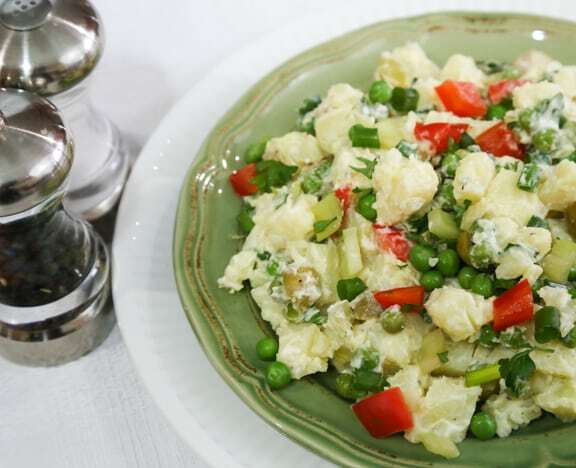 Whether you’re in need of a side dish for an everyday dinner or looking for a dish to share at a potluck or outdoor meal, you’ll find this lively potato salad quite pleasing. 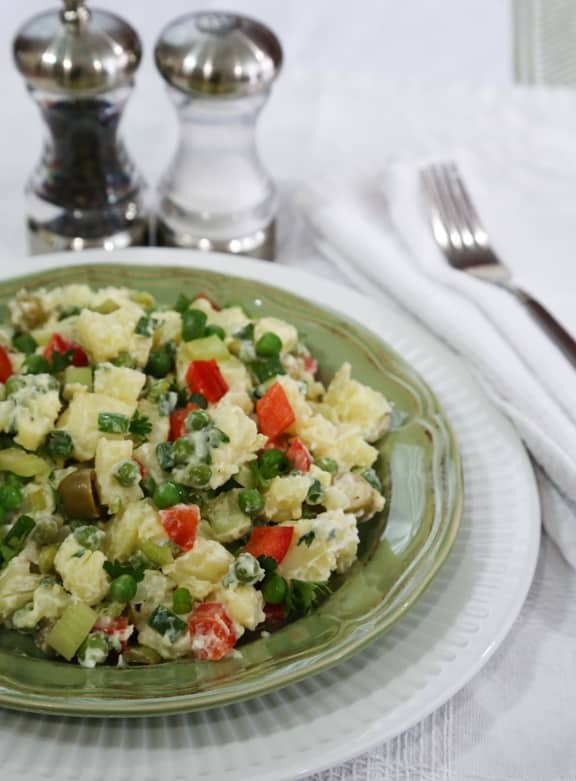 Green peas, bell peppers, olives, and herbs enliven a classic salad. Photos by Evan Atlas. 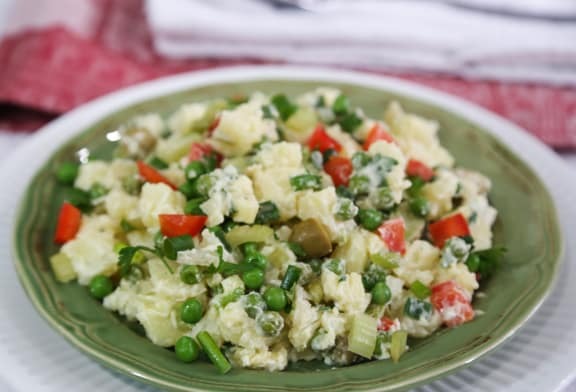 Whether you're in need of a side dish for an everyday dinner or looking for a dish to share at a potluck or outdoor meal, you'll find this lively potato salad quite pleasing. If you plan on keeping the skins on the potatoes, scrub them well. Microwave or bake the potatoes in their skins until done but still firm. Or, you can cut them into approximately ¾-inch chunks and steam them in a medium saucepan until cooked to your liking, about 15 minutes. Whichever way you've cooked or baked the potatoes, let them cool to room temperature. If you've baked or microwaved, If you prefer to peel the potatoes, slip their skins off; otherwise leave them on and cut into approximately ¾-inch chunks. Place the potato chunks in a serving container. I made this with cashew cream (thanks for introducing me to this delight!) and dill. I left out the olives and peas. I needed an egg-free recipe and this totally delivered. It tasted a lot like the potato salads they have in Japanese (my fave). To make it even healthier – the Japanese often add chopped iceberg lettuce. Thanks for the feedback, Shannon! I’m glad you enjoyed this.